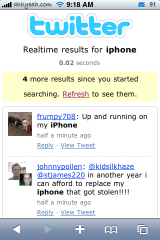 Twitter’s search site, formerly owned by Summize, is something I use everyday to keep up on the latest Twitter trends. It’s really simple. 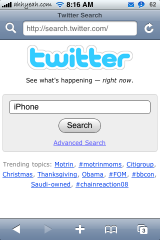 You visit search.twitter.com on your iPhone or iPod touch. You type in your search term and tap search. 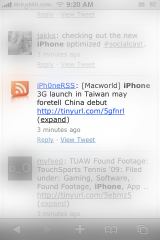 There’s also an advanced search with more features. At the very bottom of the page there is a list of trending topics. 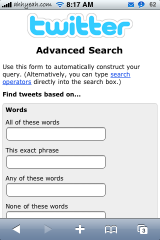 The results page shows shows you the latest tweets with your search term highlighted in bold. 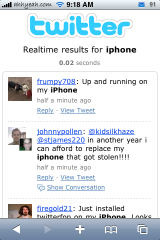 You can also reply or see the original tweet on m.twitter.com. 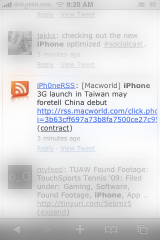 Another kewl feature is when there are new results, you will get a notification at the top of the page and a link to refresh the page. Finally, if you want to start a new search, just tap the Twitter logo at the top of the page.